If you want to "dissolve" your oil in the aqueous surfactant solution (or your water in the oily surfactant solution) then you need to know how much will dissolve, depending on the HLD value. The fact that it's slightly complicated is an indication of the power of the approach. You rarely hear of the word "solubility" being applied to surfactant systems. 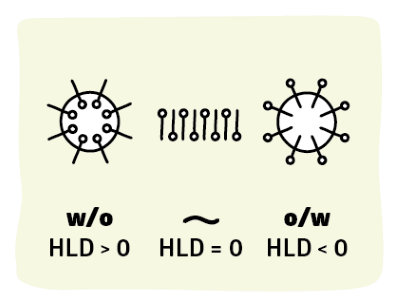 Within the context of HLD solubility has units of ml/g and simply means the ml of oil dissolved in the water phase (for Type I) or ml of water dissolved in the oil phase (for Type II) per g surfactant. Around the Type III point it is the total ml of oil in water and ml of water in oil per g surfactant. 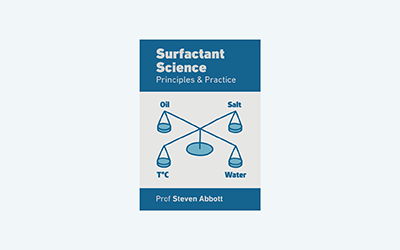 There's really only one way in which the solubility can increase - by the surfactant being at the interface. If the surfactant is dissolved (or sitting as simple pure-surfactant micelles) in the water or the oil then it is achieving nothing useful for you. So by plotting solubility against key parameters such as temperature, EACN or salinity reveals a lot about the system and tells you if your current combination of T, S, EACN and Cc are close to producing a high solubility (efficient use of surfactant) or are, instead, very far away so that no "tweak" can help you. The sliders are identical to those on the HLD form, doing the same thing as before. The only difference is that a solubility graph has been added, with the capability of plotting the effects of variations of T, S, Cc and EACN if each of the others is a constant. The calculations need some extra values: L, the effective tail length in Å, A the surfactant area in Å² and the MWt. ξ (explained in the NAC section) changes according to EACN so that oils with low EACN values show "sharp" dependencies and those with high EACN values show "broad" dependencies. Move the mouse over the graph to read out the key parameters.